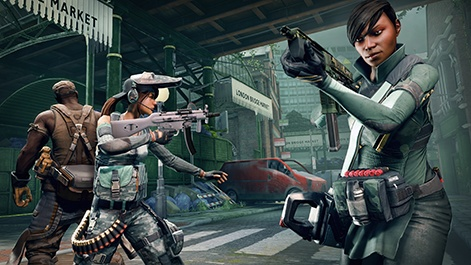 Announced back in 2013, it's been a long road from reveal to final release for Splash Damage's Dirty Bomb. 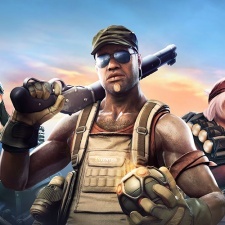 The title is a free-to-play online shooter, initially published by Nexon America, with Splash Damage taking over both publisher and development duties in February of this year. 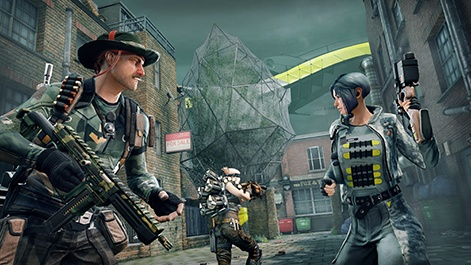 Dirty Bomb was created as a combination of shooter gameplay with the team focus of League of Legends. "Realistically for the last few years, we've seen a lot of lone-wolf stuff and just with Splash Damage's history and where we started, that's realistically not our approach. We're all about team play and co-operation," senior producer Sascha Schon says. "We actually wholeheartedly believe that good gameplay and loot and objective focused gameplay fosters amazing relationships that'll last a lifetime. The whole concept of battle buddies applies here. We're slowly seeing this gradual shift to that again. You see that on a multitude of levels; you see games on the more casual side and more on the competitive side. If you look at that scale, we're definitely more on the competitive side. Dirty Bomb has a very, very high skill ceiling; we have players with 1,500 to 2,500 hours in the game and they're still trying to improve that skill. It actually fosters a general competitiveness." The game entered closed beta in October 2013, and is yet to release 'finally' in 2018. 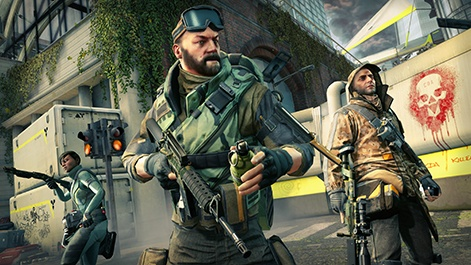 That means that Dirty Bomb has been in beta for more than three years now, something that the team says is important to make sure it is absolutely right. "The biggest thing when you launch a game is that in order for a title to come out of beta and be a fully launched title, we have to get all the staples right. It has to be a well-rounded experience for everyone without any sort of technical hurdles. At that point you should be focusing on balancing. We have taken this great step towards that. The next question is 'is Dirty Bomb going to come out of beta?' and it most definitely is. Looking at the last few months, the number of changes that have gone into the title. The team went from 22 people to 68 earlier this summer. We continue to ramp and increase our release cadence. "We are pushing an update every week and a half to two weeks, if not every week, not just bug fixes but also meaningful content, new content, events, new loadout cards, mercs, new maps. New content isn't our only focus, we're not going to abandon our previous content which is why we shipped on redux in this update, which is basically taking all the player feedback - we work closely with our playerbase because that's who the game is for - and worked with them and included them in the feedback loop. This was a major step to getting to work our definitive full launch out of beta." Game designer Sven Metzger adds: "We still want to have several things in the game before we go out of beta and that's okay. We'll have the final product and we will be happy with that. We are also always in contact with our community because it's really important for us that our long-term players are happy with it and we are too. Then we see the point that we'll want to release it. But not before." The team says that a constant cadence of content is essential for keeping fans happy as well as growing the community. "We have seen the sentiment from the audience from pushing content. Basically, releasing content whether it's improvements, buffing, balancing or just wholly new content is reiterating your commitment to your title and your service. Dirty Bomb is definitely a game we are providing as a service and if you don't water this community, it will not grow. That's pretty much where we're at. Another commitment for the roadmap is we are committing to shipping a new merc every six and a half to seven weeks. That'll have a lot of new and interesting changes and angles to gameplay. With each merc, we'll also be shipping new primary and secondary weapons as well. Each one of our maps at rollout contained a story of the lore because there's quite an extensive lore behind what's happening in Dirty Bomb. We can carry that story forward, but we also want to take another tour of the old maps based on user feedback, ones that are problematic or not as well performing or well-played maps. Depending on which map it is, it might not require that much of a drastic improvement whether it's for performance reasons or just improving the game. Obviously, there's a lot more content than that. People also like surprises from time to time. Those big staple items are on our roadmap." This consistency, Shon says, is one of the biggest learnings that the team has taken away from more than four years of development. "There's a few learnings to be gathered," he says. "Consistency is one. It comes back to commitment. You have to be consistent with your playerbase. Once you establish a certain cadence or have commitments, as soon as you fail that, there's no buying that good will back, which is why we're very careful about only committing to what we can truly commit to. "The other thing is frequency of updates; there's always room for improvement in any case and there's always feedback to be taken and there's always balancing to be done, which is important. The biggest learning we've had is working with your community and being able to be as transparent as possible. Pretty much every single team member is in touch with the community one way or another, whether it's via official or unofficial channels. That just comes back to what our DNA is - basically our founders were three people who met playing a game and started off making mods. That is how we started. That has always traditionally carried through our grassroots approach to everything and that trickles down to our products." Asked about the team's ambition for team, Shon manages to sum up the goal in one word. "We're going to be continuing what we're doing - that is creating new content and that'll grow the pool. There's definitely a few exciting things up our sleeve. We most definitively want to continue extending the lore and continuing the story that we want to tell. There's a lot of untold story as of now. We're in this for the long haul and want to continue our commitment and keep on doing what we're doing. Part of that is taking the team to over 100 people in order to make that happen and we will continue to grow as is necessary."